At Kroll Construction, our mission is to provide the superior alternative to wood windows. 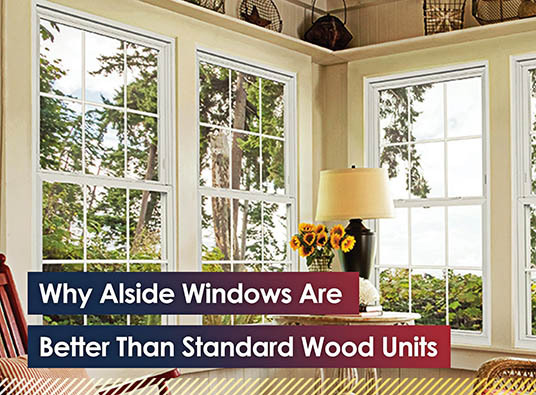 We strove to be certified by Alside because we were impressed with its premium window selection. All their models have many winning qualities in common, but they’re individually exceptional. Plus, they come with an array of customization options to suit different functional and aesthetic needs. Sheffield windows feature extra-thick, fusion-welded frame and sash construction, which is a mark of weathertight vinyl fenestration products. They have a multi-chamber design that helps trap dead air, to create an effective thermal barrier. They use ClimaTech-insulated glass packages, which, when combined with the Intercept Spacer System and triple-barrier weatherstripping, delivers excellent energy efficiency. Unlike the products generally used in wood window replacement, Sheffield custom-made units boast a sloped sill, which prevents air and water infiltration. UltraMaxx windows share many components with their Sheffield counterparts, but they have a full-capture sill as an efficient drainage system. This ingenious feature inhibits water and debris accumulation. Furthermore, they use Quad 4 weatherstripping at the header and sill to raise the level of defense against the elements. The Mezzo window is a complete departure from Sheffield and UltraMaxx units because of its remarkable combination of technological breakthroughs. The sum of its innovative parts allows it to provide superior security. It offers the incredible durability, energy efficiency and beauty from Alside products, but it’s truly in a class by itself. Don’t pour your money down the drain by putting your home improvement dollars on wood window replacement. Replace your windows with Alside to get the most bang for your buck. To learn more about Alside windows, call Kroll Construction at (888) 338-6340 today. We’ll be happy to schedule your FREE, in-home consultation in Detroit, MI, to discuss your Michigan project in detail.